William Maddox, organist and music director at Toronto’s Yorkminster Park Baptist Church, in recital on Friday, June 9, 2017 at 7:30 p.m. Mr. Maddox will perform Romantic French works and orchestral transcriptions to showcase various colors of the Blessed Trinity’s original Tellers-Kent pipe organ, built in 1927. Active as a recitalist, Mr. Maddox has been heard in recital in Canada, the United States, the United Kingdom and Brazil, as well as on the CBC. 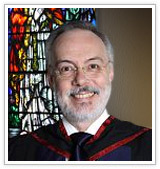 He has also served as Instructor of Organ in the School of Music at Queen’s University at Kingston, where his students were recipients of numerous University and national scholarships and awards. Proceeds of this recital benefit “Under This Roof,” a sustaining fund created in 2002 for the preservation and restoration of our architectural landmark and house of prayer. There is a suggested donation of $15 for this recital.